A solid plastic container built especially for the protection of Tefillin. It's moisture-proof, and protects against bangs, knocks, and other damaging contact. The lightweight weatherproof container is doubled-sealed, allowing you to carry your Tefillin anywhere. You can put the T'fidanit on your shoulder, and stop worrying about forgetting your Tefillin. The T'fidanit can be attached to a school bag, backpack, or even a soldier's protective vest. A Place for you Talit. Hard Plastic. Protects Against Knocks and Whether Extremes. Protects Against Moisture. Cover-inside-a-cover. 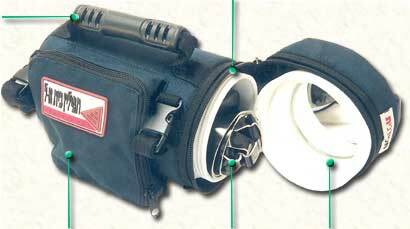 Can be carried using the handle or the shoulder strap. Place for Sidur. Hand Tefillin is put in last. Mirror.